The original wooden tillers supplied with Bell kits were made of ash and 920mm long. 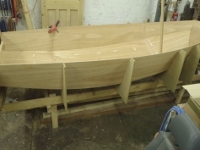 More recently 25mm outside diameter anodised alloy tube was used instead instead of wood and is best glassed onto the head of the rudder stock. Available in different lengths, materials and styles of grip. Very much a matter of choice, and the length of the tiller can also affect your choice. If it's too long you may find it difficult to get past the parts of the mainsheet (centre or aft mainsheet), or under your arm (centre mainsheet) when tacking. 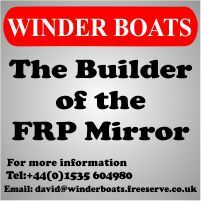 P&B recommend the Allen Brothers A4298 for a Mirror (using a Winder rudder stock), this is 762mm long.